What is a Community Mobilization? - is a 'call to action'. - promotes consideration of the needs of specific populations and localities. - provides a sense of ownership is crucial in building sustainability. 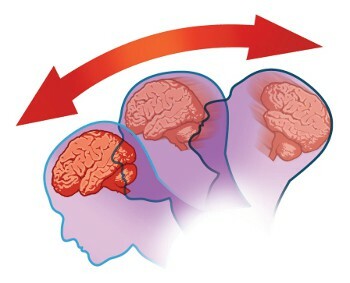 TBI is caused by a blow or jolt to the head or a penetrating head injury that disrupts the function of the brain. A concussion is a common form of...brain injury, and can be caused by a direct or indirect hit to the head or body (for example, a car crash, fall or sport injury). This causes a change in brain function, which results in a variety of symptoms. With a concussion there is no visible injury to the structure of the brain, meaning that tests like MRI or CT scans usually appear normal. When a person suffers a concussion, the brain suddenly shifts or shakes inside the skull and can knock against the skull's bony surface. A hard hit to the body can result in an acceleration-deceleration injury when the brain brushes against bony protuberances inside the skull. Such forces can also result in a rotational injury in which the brain twists, potentially causing shearing of the brain nerve fibres. Durham Region: a community where brain injury awareness, prevention and support is evident in all aspects of our lives as we learn, work and play. To weave brain injury awareness, prevention, policy and support into the fiber of Durham Region society through community action. society through a multitude of channels. enhanced communication, education, policy and enforcement. - Enhance the support provided to Durham Region citizens.